The decision to sell your home may be the most important financial decision you ever make. We want to make the experience as positive and rewarding for you as possible. Whether you are selling your first home or a waterfront estate, you can count on Dream Realty USA to deliver the style of service you have come to expect from the most trusted name in real estate in the area. We are dedicated to providing you with an exceptional real estate experience. 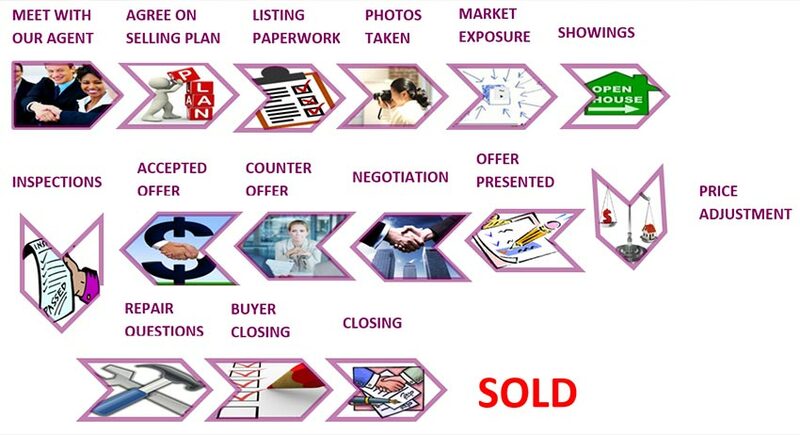 After reviewing the selling steps in the diagram below, call a Dream agent today to walk you through the process and help provide you an enjoyable selling experience. At Dream Realty USA, our main goal is to inform you of the process and events of selling your home. Through educational meetings and counseling with one of our Realtors, together we will discover what you need and want to sell your home. With research, along with reviewing different market prices, there are times when you are able to test the price and value of a home compared to its marked price at the current time. Sometimes the property may be worth more or less than the listed price. This is the major step when you decide to team up with a Realtor and brokerage firm. The listing paperwork allows your Realtor and broker to place your property on the market and make it known to the general public. Confirming a “meeting of the minds” is an important part for seller and the agent. Photos of the home are the main attraction to buyers looking for their wants and needs within the space. Appealing and detailed images can create the sense of “home” to a buyer. Dream Realty USA will market your home better than most companies. In addition to listing your home on MLS, we will also inform our large company database of buyers and sellers that your home is now available. We help spread the word with advanced systems. Social media is an every growing method and we will use it to maximize the exposure for the sale of your home. Viewings of your home can be scheduled accordingly, to provide opportune buyers to see your home for themselves. Having your home’s interior and exterior ready to view is important to display all its potential to the prospective buyer. Adjustments in price, whether it may become higher or lower throughout the process, is definitely something that happens more often than none. This may occur depending on market conditions at the time, or whether or not the house has had any showings or offers. Generally after a successful viewings you should expect an offer, and sometimes multiple offers. Your agent will present the offer(s) to you and review them. This is a great time to discuss the offer(s) and current market conditions to help you receive the highest and best offer. Negotiations are a healthy and normal step that may occur during the selling process. Working with your agent is crucial at this point. Constant dialog between buyer and seller, through your agent is important to keep both buyer and seller “at the table. After careful consideration of offers and negotiating, you may want your agent to present a counter offer. Remember, your agent works for you and ultimately you make the decision. Your agent will professional present the offer of your request. As a result of the negotiation process, a final agreement will occur regarding the price and condition of the home between both parties. Inspections are necessity in discovering any issues that may not be visible in plain sight. Issues can potentially range from minor to major, furthermore determining the interest in the home. Once an inspection has been conducted, it is both welcomed and encouraged to answer any question the buyer may have. Potential buyers want to be informed of what to expect from their new home. Your agent will inform you of what will be required to complete the sale of your home. This is done through the closing process which will transfer ownership. With good preparation and planning with your agent, the process will go well. A date will be made between both parties in which the official legal documentation will be signed, ownership will be transferred accordingly and money will be transferred and/or paid due at closing. You have officially sold your home!